Well it's been an absolutely brilliant long weekend. On Friday I went along with a load of old friends to our friends Alan and Ruth's wedding at Leez Priory in Essex. The venue was absolutely stunning, the company was excellent and the wedding itself was really lovely. Of course there was the inevitable sore head yesterday morning but the drive home was OK. And the laziness continued as I just caught up on some reading and much needed relxation. I did get up early this morning as I had a ton of work to catch up with. It's always good when the unread email reaches well over a hundred and the unread RSS feeds are over a thousand :-o. 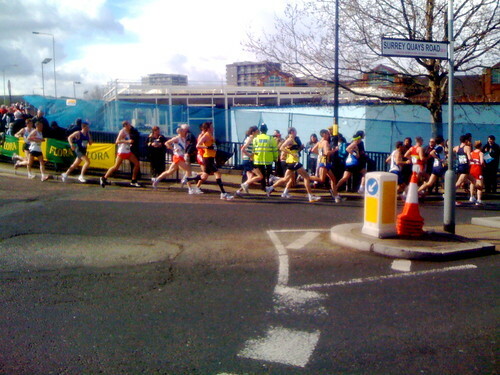 The other thing happening today is the London Marathon which runs past my flat at about the 7 mile mark. So I went down to cheer along the runners for a while. All very inspiring stuff with hundreds of people watching along the side of the road.